That´s exactly what QE1 and QE2 showed! Although Scott Sumner has lately been fond of saying that Bernanke “favors” NGDPT, he always justified QEs with the argument that it would lower long rates! Exactly Marcus…this idea that monetary policy should be used to kepp bond yields down does make any sense at all. In fact it likely distort market prices that otherwise might provide us with important information on whether or not monetary easing is work. And I agree the effect of QE1 and QE2 was to increase long bond yields – and that exactly shows that that it worked. “Operation twist” have not had that effect and it is therefore questionable whether it is working. The 3-year LTRO from ECB, however, has pushed up US bond yields. It is Draghi and not Bernanke who is easing monetary conditions in the US at the moment. Or: monetary easing should increase all asset prices *except* safe bonds. So what message does it send when a central bank buys safe bonds? Max, that is totally correct and as I wrote to Marcus above a policy of trying to keep bond yields low does not make any sense at all – and it is especially concerning that central banks are trying to distort market prices that might otherwise tell us where the economy is going. It is koo-koo talk to say government can force interest rates by printing money. Financial repression? Interest rates are low as the Fed and ECB are asphyxiating the global economy through peevishly tight money. If you look at the error terms (difference between the two curves) https://marketmonetarist.files.wordpress.com/2012/03/10ybondngdp.pngpng, the differences in % terms are non negligible. Secondly, the 10 year note yield is correlated with macro expectations, you buy treasuries when you think there is going to be a downturn, and sell on the upturn. By lagging the market expectation of future growth onto the past and then seeing a correlation it’s not only faulty statistics but it is obvious why it correlates as when people see GDP growth they sell treasuries! Treasuries are an inferior good. I respect your work but believe that the series’ names are reversed in both charts above. I attempted to duplicate them using data from FRED and noticed that it is the 10-year T-Note’s five-year average that peaked above 12% in 1984-85. This is intended to be helpful. 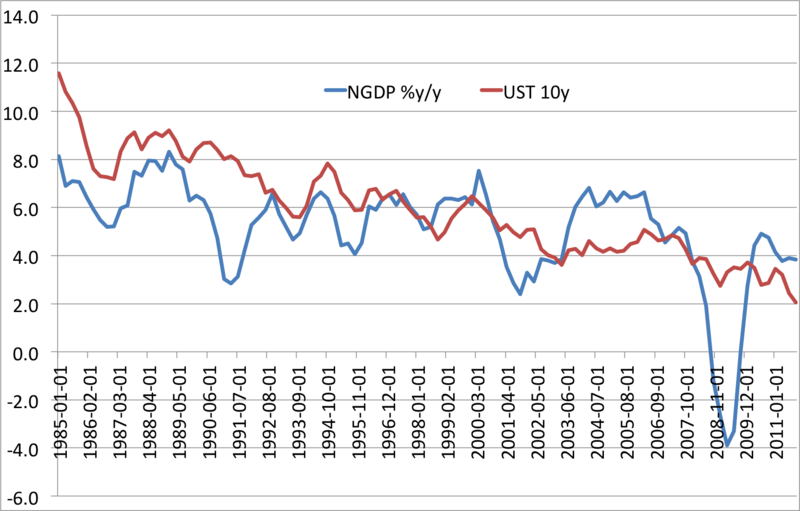 The implication is that the T-Note’s trend has followed GDP’s trend since 1965 (and also since 1958), and not the reverse. Thank you Clare. I am not to proud to admit I made a mistake so I will have a look at the data again. Thanks for the input…I will get back to you on this once I have had time to look at the data. I also used FRED. Clare, I have now had a look at the data. I hate to admit it, but you are right. I had mixed up the two data series. That just proves the point why you should leave this kind of thing to research assistance! Thank you very much for spotting the mistake. I will naturally correct the graphs and the text asap. I’m guessing that this applies to Treasuries, and not the problem with the PIIGS. Don’t think we can look at any country and say tight money means low bond yields, point to Spain, for instance, and say that money is extraordinary loose because the yield is 6%.